Scrofulous swellings in the skin marked by redness and/or soreness, carbuncles that are chronic, abscesses and boils marked by heat and swelling, chronic lymphadenitis, goiter due to phlegm fire, chronic lymphatic swelling, thyroid that is enlarged and mastitis of the breast are some of the imbalances satisfied clients have used this product for. Nei Xiao Luo Li Wan addresses scofular and tubercular swelling that is common under the skin along the neck and also chronic lymphatic swelling. 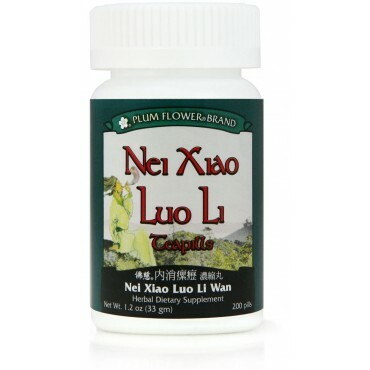 Nei Xiao Luo Li Wan treats heat toxins with underlying stagnation of qi and phlegm that together forms the nodules. It may be effective for goiter if it used long term. Clears heat, disperses swelling, dissipates nodules, resolves toxins, softens hardness, transforms phlegm. Prunella vulgaris spike, Scrophularia ningpoensis root, Halitum mineral, Angelica sinensis root, Mentha haplocalyx herb, Citrus aurantium fruit-ripe, Rheum palmatum root & rhizome, Platycodon grandiflorum root, Forsythia suspensa fruit, Sargassum pallidum herb, Fritillaria thunbergii bulb, Trichosanthes kirilowii root, Glycyrrhiza uralensis root, Rehmannia glutinosa root-raw, Ampelopsis japonica root, Meretrix meretrix shell, Natrii sulfas exsiccatus, Botanical wax, Talcum. - Xia ku cao, Xuan shen, Da qing yan, Dang gui, Bo he, Zhi ke, Da huang, Jie geng, Lian qiao, Hai zao, Zhe bei mu, Tian hua fen, Gan cao, Sheng di huang, Bai lian, Ge ke, Xuan ming fen, Botanical wax, Talcum.